Clean the artichokes and fry the heart only in cooking oil. Add hot water, salt and cook til softened, then blend until creamy and leave it on the side. Wash the mussels thoroughly. Put the garlic in cooking oil until golden, then add the mussels and cook until they open. Separate from their shells and keep the juice that’s left. Cook the linguine al dente in salty water, finish them into a pan adding the mussels’ juice,the mussels and olive oil. 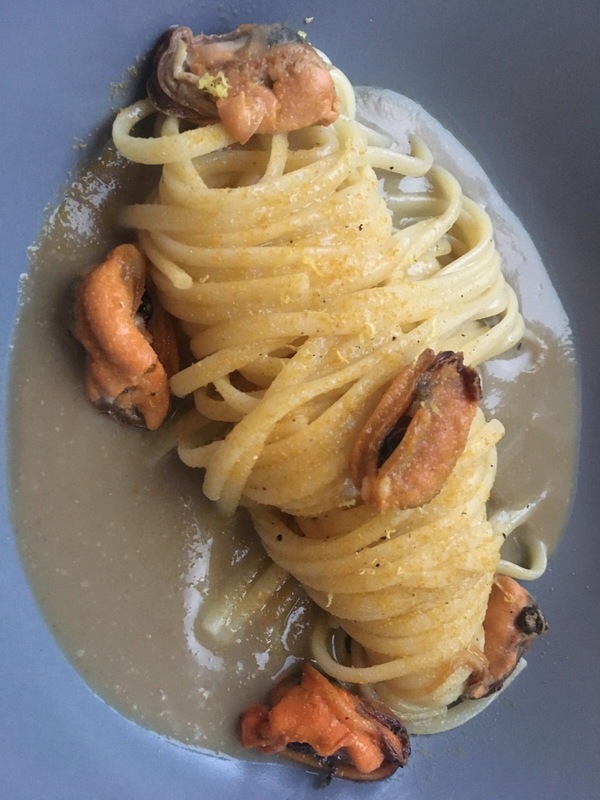 Put the creme in a bowl plate, place the pasta nicely over it, the mussels and finish off with bottarga power. Easy, fast and tasty.